The sleek design of the NX1000, with a few performance and design features of the high-end NX20. Focus can be set manually on the NX210, but controlling the focus depends on the lens you're using. There are some manual focus assist functions built into the camera (like a focus zoom) that can help when you set focus, however. There's also two types of autofocus, one being a continual autofocus and the other being the more traditional single-shot AF. The continual autofocus can be slow at times, but it is accurate and it even works during video recordings. It's also one of the premier benefits of using a mirrorless camera as opposed to a traditional DSLR. Both shutter speed and basic exposure adjustments can be made on the NX210, and the camera's fastest shutter option is 1/4000 of a second. If you want more than that, you must jump to the NX20, which goes up to 1/8000 of a second. Slow shutter speeds are featured on the NX210 as well, going down to 30 seconds and a bulb mode that can last for up to four minutes. Featuring an ISO range from ISO 100 to ISO12800, the Samsung NX210 shows a reasonable range for a compact system camera. You can also switch over to auto ISO, which allows you to set an upper limit to the ISO the camera will choose automatically (ISO 3200 is the max upper limit in this mode). If you don't want to set white balance manually or select a specific Kelvin color temperature, you can probably get by with the NX210's auto white balance setting. It worked well in bright, outdoor light during our time with the camera, but we can't say how well it will do under mixed indoor lighting. There are also a number of white balance presets on the NX210: Daylight, Cloudy, Fluorescent (three different types), Tungsten, and Flash. 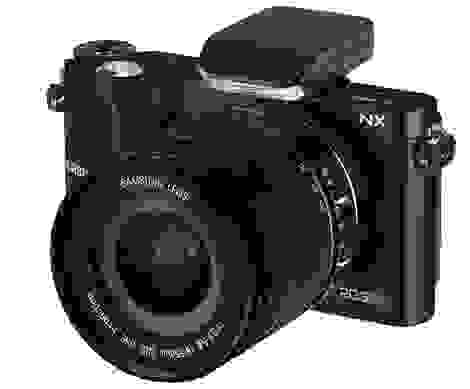 There are two different set of picture effects on the NX210. The first comes in the form of Samsung's Picture Wizard modes that include preset color options like standard, vivid, portrait, landscape, forest, retro, calm, cool, classic, and custom. In Picture Wizard you can also make slight adjustments to contrast, sharpness, saturation, and color. It's basically like having a small palette of photoshop tools at your disposal (before you take your shot). There's also a selection of smart filters that are similar to the picture wizard mode, but are more like digital effects that manipulate your video or stills.